Hardware Color Rose Gold-toned. Color Black. Dustbag Included. 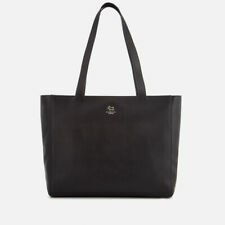 Radley London presents a go-to tote bag in sturdy leather outfitted. A hidden leather tab behind the shoulder strap allows you to affix your own. 1 back slip pocket, feet and tab behind front shoulder strap. In a rose-gold tone, Radley London's spacious hobo comfortably. Rose-gold-tone exterior hardware, 1 snap pocket, removable Radley dog charm & feet. 1 interior zip pocket & 2 slip pockets. 10-1/5"L hobo strap. Rose-gold-tone exterior hardware, 1 snap pocket, removable Radley dog charm & feet. We do our best to ensure all products are in their great condition. We will reply you at the latest within 6 hours. Long handles which fit comfortably over the shoulder. With floral pattern on the surface. There is a leather RADLEY LONDON label on the inside. RADLEY LONDON is embossed on the label on the back of the bag. There is a RADLEY LONDON dog dangler. Colourful RADLEY dog patterned fabric lining. RADLEY WOVEN /LEATHER BAG. IN VERY GOOD CONDITION. Hidden front slip pocket. Back slip pocket. "RADLEY, LONDON" leather label inside and a leather label on the back with "RADLEY, LONDON". Dark red RADLEY fabric lining with little dogs all over it. At the front of the main section there is an open topped pocket. fuNky&ChUnKy Summer Radley Hand Bag VGC (S/M) RRP£149 BfUnKy4LeSs! From BfUnKy4LeSs! • Added polish kit left over from another Radley bag.bonus! Used lightly and enjoyed but with care.therefore not sold as new or perfect. bag is still clearly in very good clean condition. I have another Radley bag that I tend to use more and am having a cleanse of bag collection. 25cm H x 33cm L x 12cm D and handle drop is 25cm. Sorry for the moan but this seems to be happening quite a lot recently! 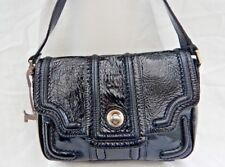 Radley Leather Tote Handbag Shoulder Bag in very good used condition. Clean lining and outer. 2 main sections with 3 zipped pockets - one middle zip and slip pocket on back. Key clip inside bag. Dog tag charm attached. Size approx L12ins x H10ins x W4ins Roasted red. BOTH HAVE A DUST BAG. THE ORIGINAL PRICE FOR THE HANDBAG WAS £229 AND THE PURSE £72. Rose-gold-tone exterior hardware, 1 snap pocket, removable Radley dog charm & feet. Style Tote. Hardware Color Rose Gold-toned. We do our best to ensure all products are in their great condition. Lining Color Gold. In a rose-gold tone, Radley London's spacious hobo comfortably. Rose-gold-tone exterior hardware, 1 snap pocket, removable Radley dog charm & feet. Closure Flap. Hardware Color Rose Gold-toned. 1 interior zip pocket & 2 slip pockets.